Superb. I loved the brilliant colors which have come so well. Once I captured a very colorful spider with similar colors. PN SUBRAMANIAN: I took this picture at Dakshina Chitra, on ECR, Chennai. I nearly stamped on it...it was camouflaged on the steps very well! It has already lost/broke one horn! What clarity! Which is this insect? ASHWINI SRIRAM: Yes! It do look beautiful! SWARAM: All light colours, except a patch or two! USHA PISHARODY: Some sort of beetle, I think. It was not visible at all. It moved slightly and I and my friend saw/noticed it! I could not make out.I thought it was a crown or some such thing till I read the comments. I am ok with any insect as long as they don't fly. I am afraid of 'flying insects'. KPARTHASARATHY: Yes, it was camouflaged very well. I and my friend, noticed it accidentally. Then started clicking! SUJATHA SATHYA: Isn't it beautiful. We bent down and admired for a long time before clicking! I took it in a paper and placed in the sand in a corner so that no one stamped on it. Lovely creature! DESTINATION INFINITY: I don't like flying things flying near my face, even mosquitoes! Yuck! KANAGU: Thank you, I took it from my mobile camera! It looks lovely, isn't it?! You have captured it so well! So vibrant! wow..almost merging with the floor! ASHOK: Yes, it was not visible in the beginning. It moved a bit and we noticed it! VARUNAVI: Maybe! The area is full of trees. That might be the reason these creatures are still surviving! KANAGU: Thank you, Kanagu! 2 Kilo weight yeriaachchu! I have many memories of Dakshina Chitra. Shall try to put it some day. Incidentally there is something about Koyambedu just waiting for you. Grey and red always make a pretty combination. ROSHMI SINHA: Yes, Roshmi Sinha! Thank you! PN SUBRAMANIAM; I have not yet visited Koyambedu even once though I am in Chennai! Beautiful!!! And what a camouflage! Hi Sandhya! I'm so sorry to barge in on your post with an unrelated query, but I noticed you commented on a post saying you had been to a wedding on the theosophical society campus? I wanted to ask you about that. If you could send me your email Id or email me at superme_in (at) yahoo (dot) com, I would really appreciate it! I look forward to hearing from you! INDIAN HOME MAKER: As I had written in the earlier replies, I would have missed it if it hadn't moved a bit! It blended with the surroundings beautifully! GUARDED ANONYMITY: I had attended the wedding some 17-18 years back and I don't remember anything else about it. PRASOON: Welcome to my blog, Prasoon! 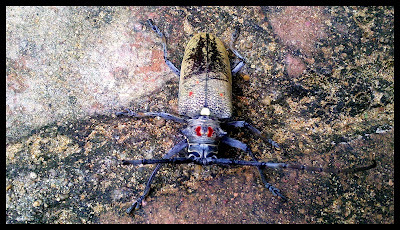 It is a sort of beetle, I think. Spiderman? Everybody, even I, dream about being a spiderman! CHRISTY: Welcome to my space, Christy! I still remember the insect! It was sitting/slowly moving on the steps. I must have been looking at the ground while stepping down. Otherwise it wouldn't have been visible. Blended with the surroundings! Carnage, A Simple But Interesting Movie!